For RM5, you will get a bowl of noodles (of your choice, but unfortunately there’s no yee mee) filled with generous amount of minced pork meat (which consist more of lean meat), sliced meat, offals, vegetables and a poached egg (optional – without it would cost RM4.50). The broth is what it has probably made this stall famous; dense and savoury, infused with pork essence and preserved vegetables (菜哺). The broth is that delicious that on most occasions, I’d emptied the bowl without hesitation. Despite being listed here, this stall isn’t one of my favourite stalls of them lot. Sure, the broth meets the requirement. But for RM7 (the latest price I paid), the portion and ingredients given did not justify the price even for its prime location. As shown above, there are only 4 to 5 tiny cubes of minced meat, a couple of sliced meat, offals and vegetables. To ‘glorify’ the bowl of noodles, it is served in rather huge bowl with plenty of soup. The noodles are submerged deeply and are just mouthful; insufficient even for normal eaters. That said, it is still famous amongst pork noodles lovers for whatever reason it may be. So, there you go… my favourite pork noodles stalls in Klang Valley. Most of them opens for breakfast and lunch except for Restoran Hong Cha. Again, these are not the best of the best of the best in Malaysia and therefore, feel free to share your favourite stalls! Waahhh….pork noodles! My favorite leh… Nice summary of pork noodle. Have you tried b4 the one at SS15? Ppl don’t mind waiting for almost an hour for a bowl of pork noodle. Thanks for the list, will try them out if happen to be there! Okies…am gonna check out the stalls. My regular is now Mei Sin. 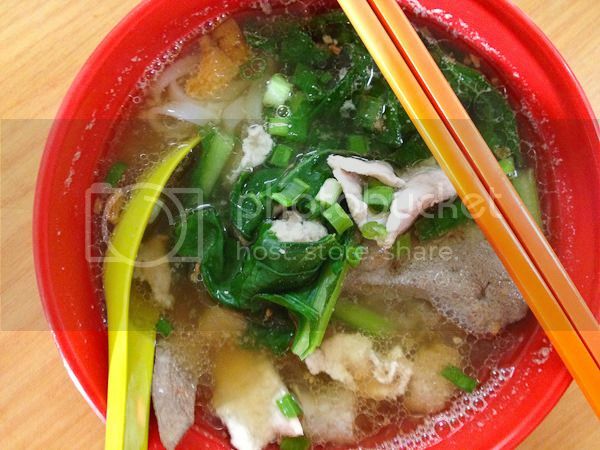 Used to be Win Heng Seng but it seems the soup is now strangely sweet…and crazy expensive! Sean : Yea, OUG should be your first stop as the rest are only open during daytime. missyblurkit : Yea, the one at WHS is crazy expensive and the portion is tiny. I like the minced pork at Mei Sin. Hehe. Chasing Food Dreams : LOL! Thanks for sharing! But all your favorites are in KL?